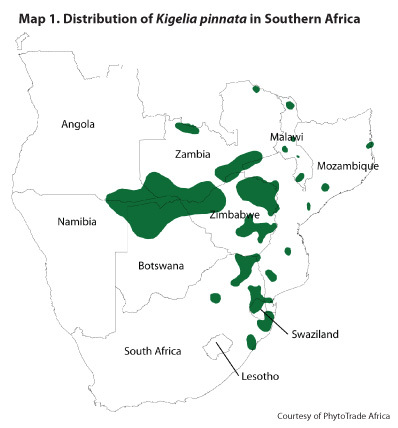 Southern Africa contains over 30,000 plant species, many of which have potential as economically useful plants that are relatively unknown to Western civilization due to past trade embargoes and regional strife. In fact, only 50 of these species are currently traded to any significant degree. A few hundred of these species are already known in preliminary research to have potentially beneficial biological activities. The potential medicinal benefit is large. With new ethnic ingredients in cosmetics and so-called cosmeceuticals being launched into the Western market, it is only a matter of time before African botanicals are targeted as potential sources of new drugs, cosmetics, and cosmeceuticals by members of industry. One native African plant with great curative potential is the sausage tree (Kigelia africana; syn. K. pinnata*). Kigelia is now generally considered to be a highly variable monospecific genus of the family Bignoniaceae. Although several species have been reported in the past, they are also synonomous with Bignonia africana, K. abyssinica, K. acutifolia, K. aethiopum, K. africana, K. ellioti, K. elliptica, K. impressa, and K. spragueana. The aim of this article is to review the ethnobotanical uses and scientific research regarding this useful plant. 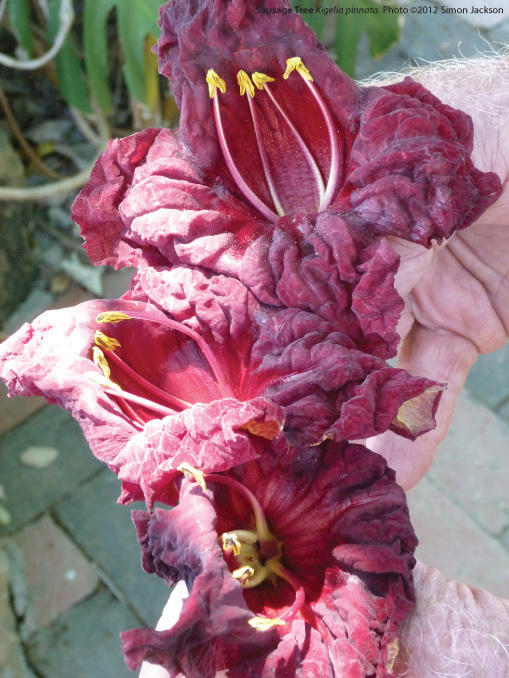 The iridoids found in Kigelia correspond to the 9-carbon skeleton type, e.g., catalpol, found in other members of the Bignoniaceae family. The major iridoids found in the root bark and stem bark of K. pinnataare specioside, verminoside, and minecoside.25 These iridoids, specifically verminoside, have had the most scientific literature published on their unique anti-inflammatory properties. In vitro assays showed that verminoside had significant anti-inflammatory effects and inhibited both iNOS (nitric oxide synthase) expression and NO (nitric oxide) release in macrophage cell lines.26,27,28 Further research also was undertakenin vitro on the cytotoxicity and cutaneous irritation of Kigelia fruit crude extract on skin cells grown in monolayers (ML) and in reconstituted human epidermis (RHE, 3D). These tests found that neither the iridoids verminoside nor verbascoside extracted from the fruit of the plant caused any release of pro-inflammatory mediators, and no histomorphological changes were noted of the RHE,29 further suggesting anti-inflammatory activity. If norviburtinal is the major cytotoxic compound present in the fractions, then its concentration should approximate to the IC50 value of the fraction or extract. The calculated concentration of norviburtinal shows that its concentration in the active fractions is well below its IC50 value; so although it probably contributes to the overall cytotoxic effects observed, it is likely that other active substances are present that eluded isolation due to their small amounts or because of decomposition during the fractionation and isolation procedures (see Table 3E online†). The presence of other napthaquinoids has been reported from the stem bark, but they were not detected in this investigation. The discrepancy between content of norviburtinal and cytotoxicity might also be explained by the possibility that other substances present in the bark or fruits work in synergy with norviburtinal.35 As shown in Table 1E†, the crude extract of Kigelia had a lower IC50 value than isolated compounds alone, perhaps giving credence to several compounds’ working together synergistically to give an overall anti-neoplastic effect. One organization dedicated to the sustainability and scaleability of African botanicals is PhytoTrade Africa (www.phytotradeafrica.com). This nonprofit trade organization, which represents various natural products producers in the southern Africa region, states that the global natural products industry—including the key sub-sectors of food and beverages, cosmetics, herbal medicine, and pharmaceuticals—is currently valued at $65 billion USD per annum and is booming with a 15-20% annual growth rate in the last few years.55 The current (as of October 2010) formal natural products trade in the southern Africa region is estimated at only $12 million USD per annum, although it may have the potential to grow to $3.5 billion USD per annum (data are based on author’s presentation at the United Nations Food and Agricultural Organization in October 2010, in Harare, Zimbabwe). The market appears to be set for steady long-term growth, and tapping into this market is attractive for several reasons, particularly in the number of beneficiaries and their location in areas of low agricultural and economic productivity. 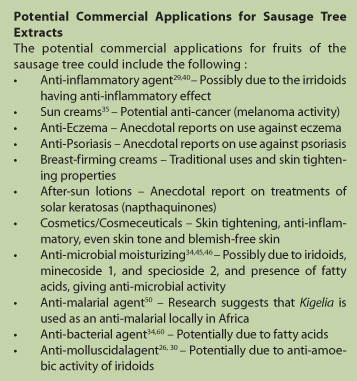 The sausage tree is only one such example of a raw natural African botanical that could unleash a whole range of useful extracts, chemicals, and drugs for use in numerous markets. 19. Govindachari TR, Patankar SJ, Viswanathan N. Isolation and structure of two new dihydroisocoumarins from Kigelia pinnata. Phytochem. 1971;10:1603-1606. Cited by Oliver-Bever B, in Medicinal plants in Tropical West Africa.Cambridge, UK: Cambridge University Press; 1986.